One set of the Ibarra Family: The student has become the teacher. Robin, or should I say "Ms. Robin" was my teacher in one of my college classes, however, she also is one of the craftiest talents I know. So I stole one of her ideas and made a wipe case for my cousin. I was pretty excited that it turned out o.k. for my first try. 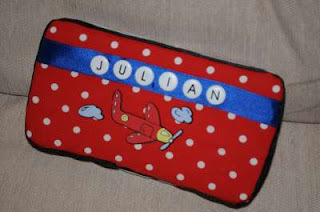 Baby Julian's nursery is red, white, and blue airplanes. I also made him a matching burp cloth, but forgot to take a pic, it was not quite as good as the case, but acceptable. I will be making another one for my other cousin, Tim's sister, and our friend that lives in MO. I will let ya know how they turn out. That is too cute, you have do more and share.